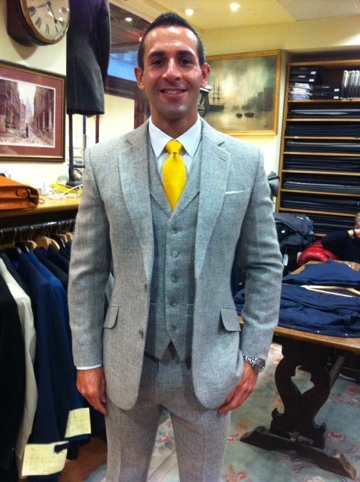 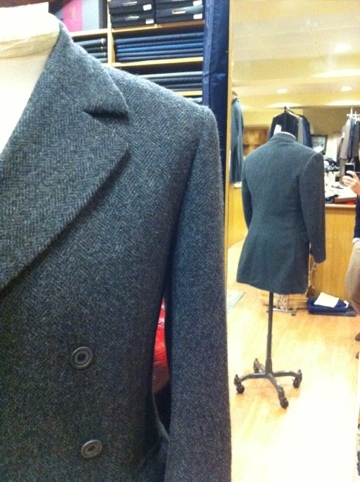 Here is more Caccioppoli soft tailoring as we’ve shown in previous posts but in the flesh, we try to snap as much as we can on the actual person rather then dummies to show the end result. 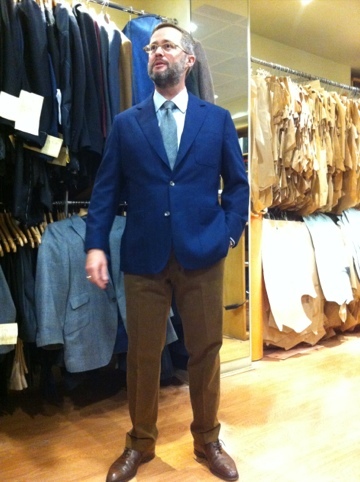 What is good about this pic is that it is a combo, the jacket is the Caccioppoli wool and cashmere soft jacketing and the trousers are a brushed cotton from Caccioppoli’s new cotton bunch. 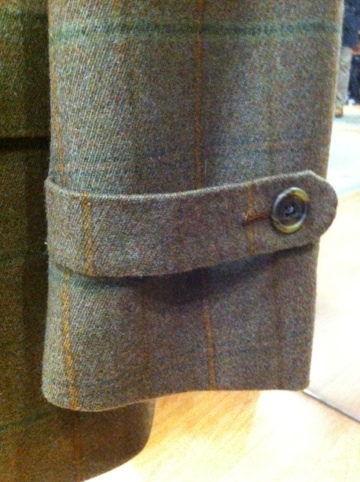 To those who are aware of the blog permanent style which I’m sure is pretty much all of you would also be aware that Simon Crompton designed his own Tweed for permanent style readers to take to their tailors and have made whatever they desire. 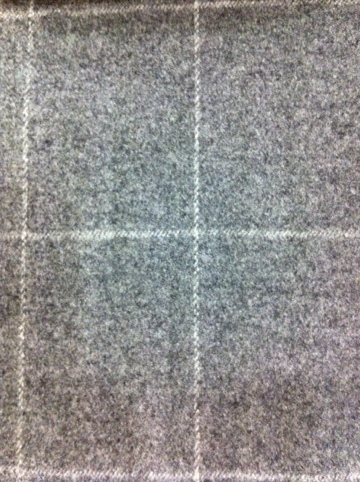 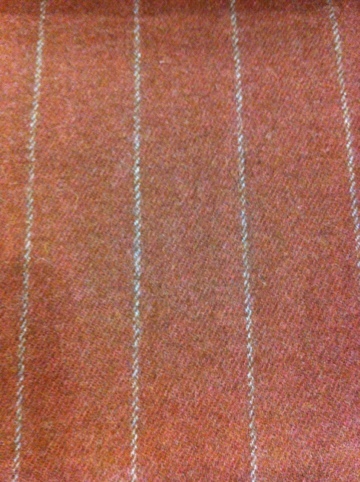 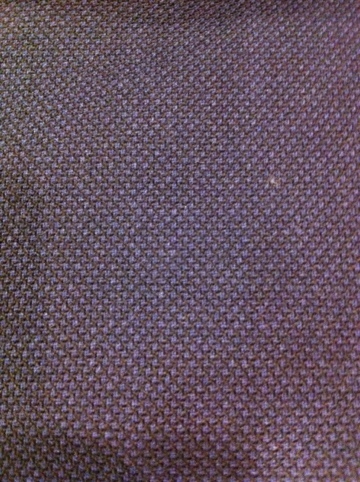 The weave is a subtle herringbone in a fawn loosely woven breanish tweed. 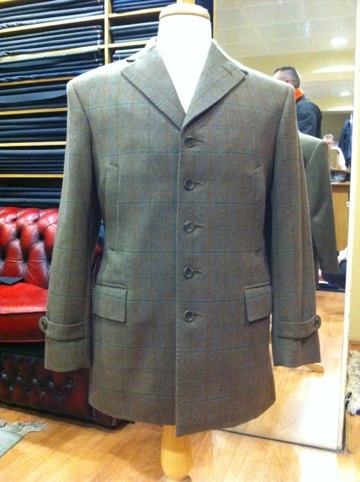 We have a few different projects in this tweed going through at present including a Norfolk jacket which I’m sure will end up on here once finished, but we think the 3 piece looks fantastic. 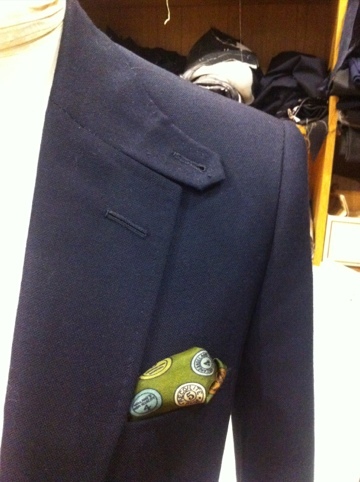 Another good look in Marling Evans ‘pandora’s’ box has unearthed another gem, this time in the form of a car coat. 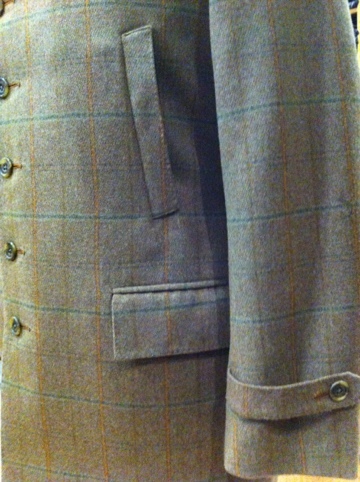 Shorter then an overcoat with welt pockets and strap and button cuff this is yet another option when thinking of a coat that would work best for you. 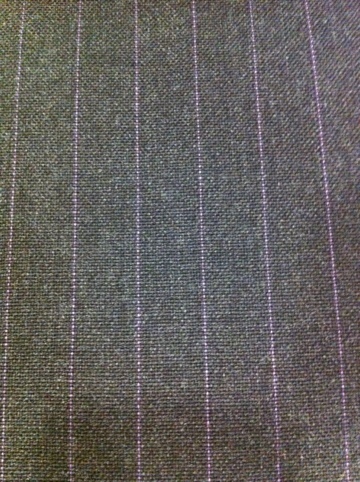 The cloth itself is quite unusual in the respect that from a distance it looks tweed but is actually a 20 oz wool coating fabric, and very soft and smooth to the touch. 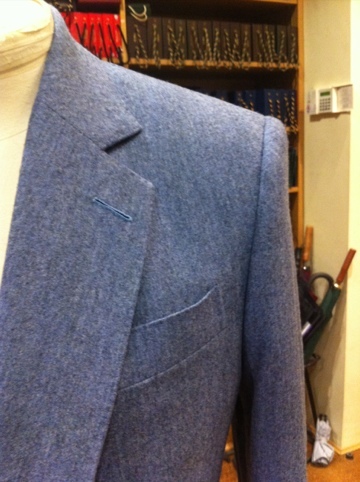 Another option for a coat, this is a single breasted fly front with a half raglan half set in sleeve in donagal. 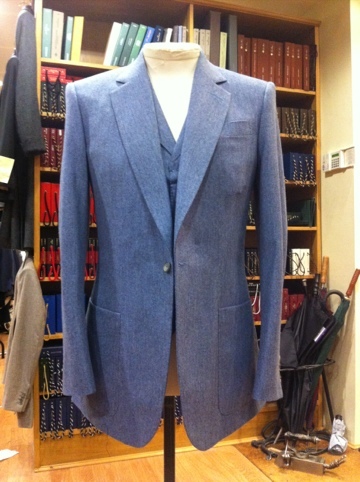 Again the choice of material makes it flexible for work and weekend wear with the half raglan making the shoulder line really soft to mould over whatever is worn underneath, a quilted cotton back lining has gone inside as its going to get its wear on cold New York evenings. 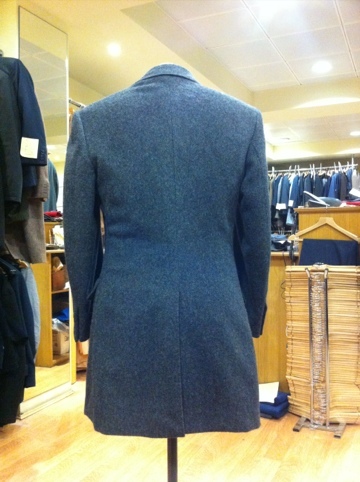 For those who ordered their coats at the back end of the summer have seemed to have timed it right. 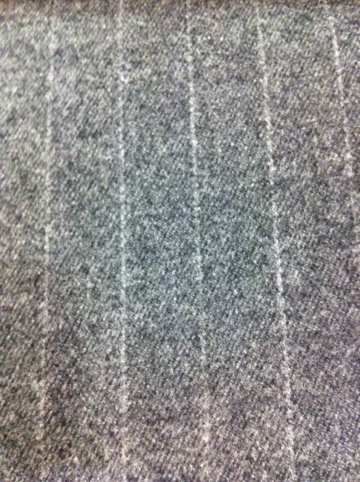 I will post all different styles of coats going through just to help if your in two minds what would work best for you. 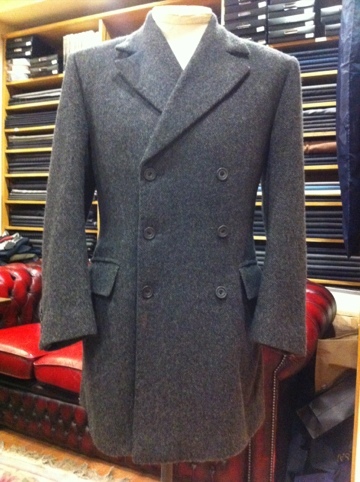 This double breasted coat in Alpaca is from William Bill’s Lamlana bunch, the aim was a coat to be worn in the winter for work and for weekends, we chose Alpaca as it has a nice soft texture but is more durable then cashmere so heavy weekend wear will not affect the pile on the cloth nor the shape, lined with cotton back lining keeps the cold out and the warmth in. 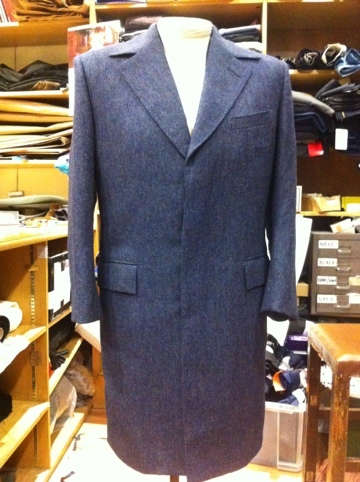 In pretty much all our posts the suits or jackets shown are newly made garments freshly completed waiting for their owner to come and collect them so whist commuting in this morning I thought it wouldn’t be a bad idea to show a garment later on in life. 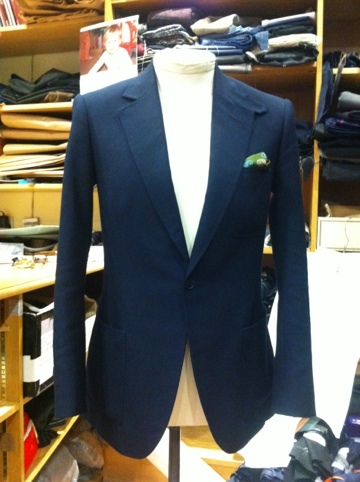 Most suits (once worn in) seem to get better with age, the heat off our body’s over time softens the canvas and it moulds slightly to our natural shape, the shoulder pads also seem to soften some what. 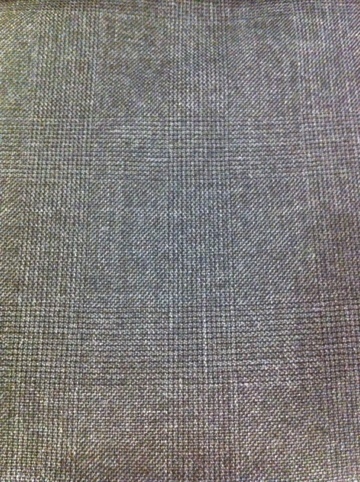 This is a suit that’s coming into its 5th year and I still enjoy wearing it as much now as when I first made it, I also think the style I chose has a part to play as when I’m not wearing it as a suit having the patch pockets and the quarter inch swelled Seam allows me to break it up and wear with a pair of grey flannel trousers, which I do a lot. 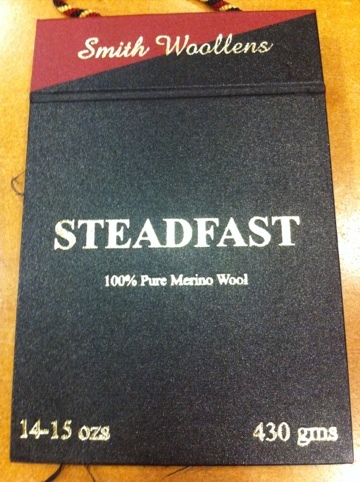 The cloth is ‘Steadfast’ by Smith Woolens, a 14 oz material in 100% Marino wool which I’ve found can be worn a least 8 months a year. 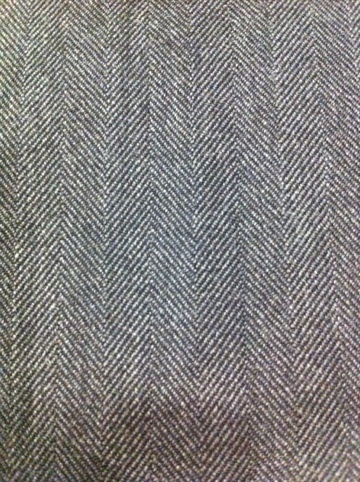 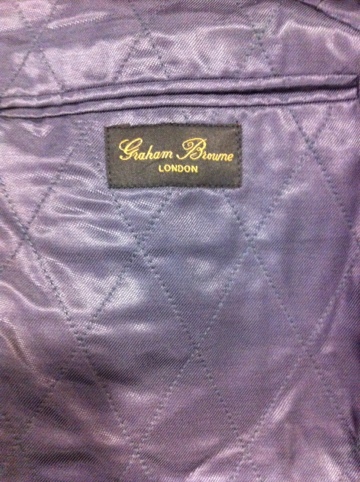 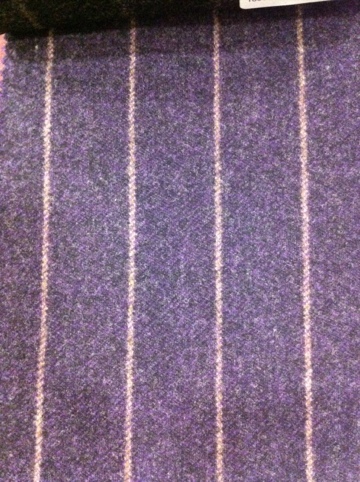 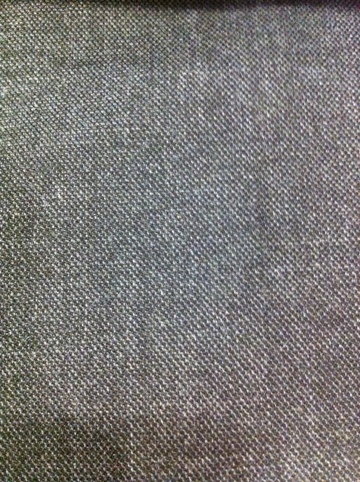 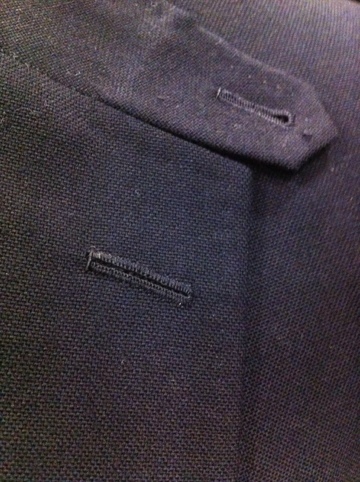 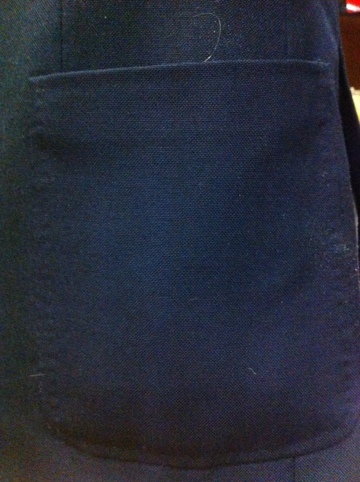 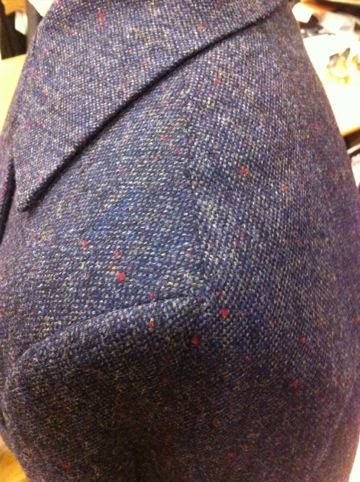 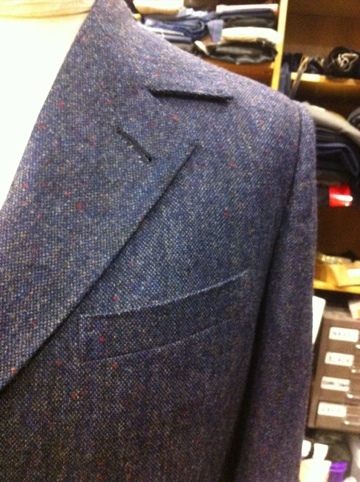 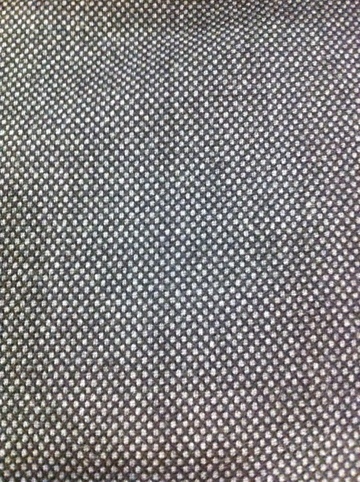 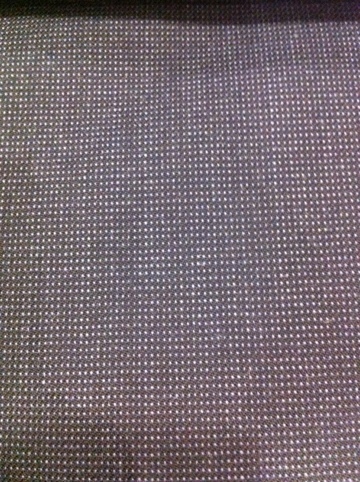 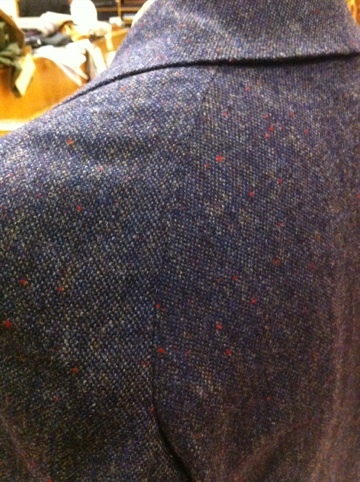 They have all the work patterns covered aswell from pinstripes and herringbones to my royal blue hopsack. 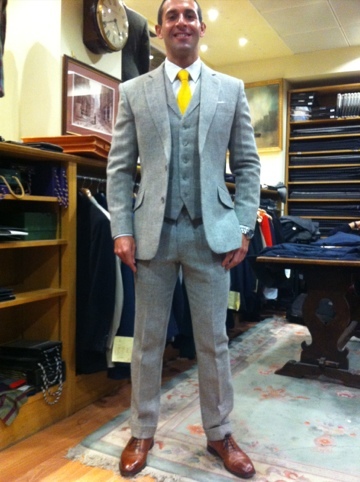 Winter is here, the crisp mornings are now upon us, it’s time to hang our lovely 9oz summer suits in the wardrobe and reach for our flannels. 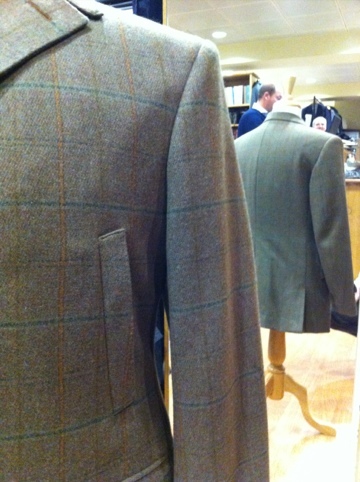 I’ve mentioned before the different options we have in flannel from various cloths houses from Fox and Smith woollens to Harrison’s of Edinburgh and H Lessers, all have a really good variety of weights and textures but not in all the colours. 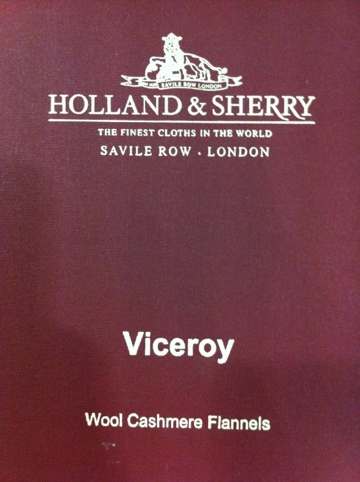 Holland and sherry have thought outside the box with their Viceroy bunch and added some colour to their cashmere flannels, some are more daring the others but as this one we made in pale blue shows you can wear a tad of colour to brighten up the cold winter grey days ahead.